Which of These Are You Most Eager To See? after seeing the 2:42 X-Men: First Class trailer, I am eagerly anticipating this movie. Yeah, they're borrowing from t he Watchmen vibe, but you know what, it works for the X-Men mythology. I have a feeling this will be my favorite of the X-Men franchise. None of these are even remotely interesting to me. you know, after I read your reply, I thought "Hmmm... maybe I should add 'None of the Above?' "
But I'd already cast my own vote, so the poll is set. Based on my doing so, and the consequences of my action, I am may have inadvertently been passive aggressive* in doing so. Even if the option had been there, I would have posted anyway. And then if someone tried to start an argument with me about it I would have been like "I couldn't care less," thus contradicting the fact that I had taken the time and effort to post about it. At least we are using the proper form of the phrase. 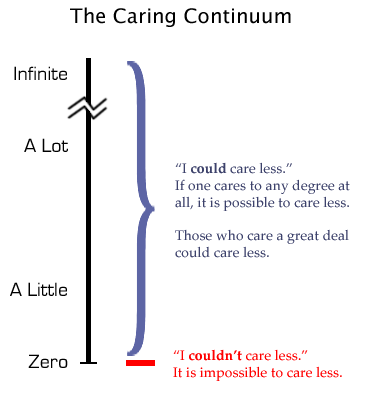 People are out there saying "I could care less." which is just wrong, and ignorant. and yet I am thinking, "Why link it, it's common sense?" The burning question on my mind, "Will Green Lantern get a legitimate vote?" Haha, apparently, I'm on the flip side of Saellys... I want to see all of them. I didn't want to see Thor but I've been hearing great things about it, so I have to now. I'm such a comic book geek, though. I grew up reading comics and even though I don't really read them anymore, I still love to watch the film adaptations that are released. I voted for the Green Lantern! I like that serious patrolman of the skies! One would think, but it's amazing how much improper and just plain illogical stuff people adopt into their personal lexicon without even considering it. Irregardless is a word now because so many people have been wrong so many times that they've managed to convince the rest of the world they're right. You hear "try and" as much as "try to" now, even though one makes sense and the other does not at all. And I once had a co-worker at a college writing center try to convince me that "far and few between" is just as valid as "few and far between." Not a student, mind you--he worked there. I'm all for the growth and evolution of the English language, but not if that growth is a product of laziness or stupidity.